The Hueinahue makes a bold statement 7.5 KM before it enters Lago Mahuie. Here the river tumbles over a spectacular bedrock falls before joining the Rio Remahue and flowing into the lake. 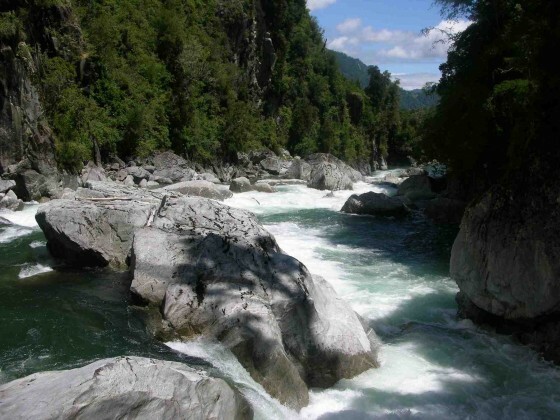 The Rio Remahue (which contains about two thirds of the combined flow) makes an even bolder statement plunging over 200 meters just above its confluence with the Hueinahue. 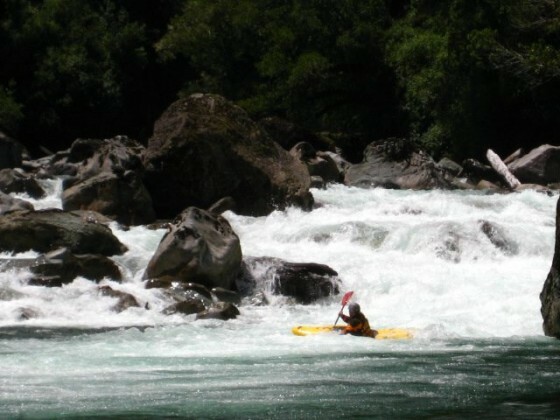 The river is crystal clear and offers boating opportunities from class 4-5 creeking, to bigger volume class 5 river running and finally mellow and scenic class 2-3 floating into the lake. The headwaters are in the 2000-meter peaks on the Argentine border and are more rain fed than snowmelt. 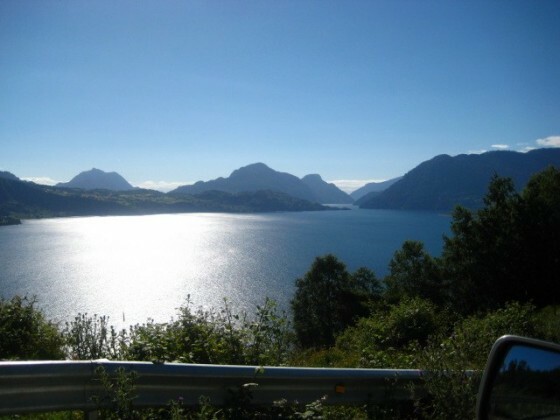 The drainage is in Chile´s Region de Los Rios and is best reached from the Futrono turn off on ruta 5, 17 km below Los Lagos. From here it is 44 km of paved road to Futrono on shores of Lago Ranco. Continue another 28 km on good paved road around the north shore of Lago Ranco to Llifén. From here it is another 35 km to Puerto Hueinahue at the mouth of the river and on the eastern side of Lago Mahuie. The elevation here is 81 meters above sea level. The put in for the middle and lower sections is reached by following the new road upstream along the river. The lower put in is at a field, 6 km upstream just before the point where the road goes from flat to steep. From this point the river is class 2-3 boulder gardens all the way to the lake. We ran the river in mid January after several days of rain and had nice level of around 1800 CFS. The elevation at lower put in is 150 meters giving the 6 km stretch an average gradient of 12 m/km or 60 FPM. If one continues upstream another 1.2 km you will cross over a log bridge over the Hueinahue Canyon with a thundering waterfall. It is here that one leaves the car. There is a small gate on the right leading up to the home of Antonio Rossi (cell phone 9-78541368) who is the caretaker for El Fundo La Encantado and after asking permission you can follow a trail down to La Junta, or the put-in for the middle stretch. Here the elevation is 200 meters and the one km stretch drops 50 m/km or 250 FPM. 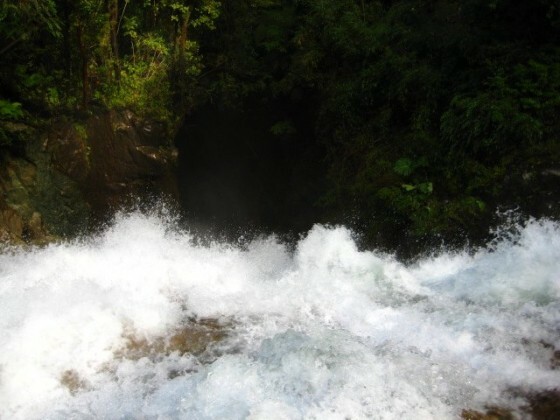 The rapids are big and long and interspersed with flat stretches. The first two rapids are solid class 5, followed by two class 3 rapids then one, long final class 5+ which at normal flows can not be portaged at river level. The middle stretch is more runnable when the lower stretch getting low. Above the waterfall the main branch of Hueinahue is much lower volumen and more creek like. The Access requires shouldering the boat and walking up a good trail on river right. The river is bedrock and reminiscent of the Rio Nevados. A 3 km walk will provide 2 km of class 5 kayaking that averages 50 m/km. The upper and lower sections of the river are best run in spring months of November/December and the middle section can be run lower.